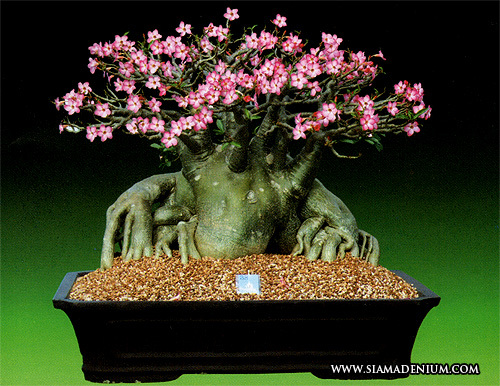 Get to know "Adenium Styles"
Today I would like to introduce Adenium defined with mainly popular form and structure. 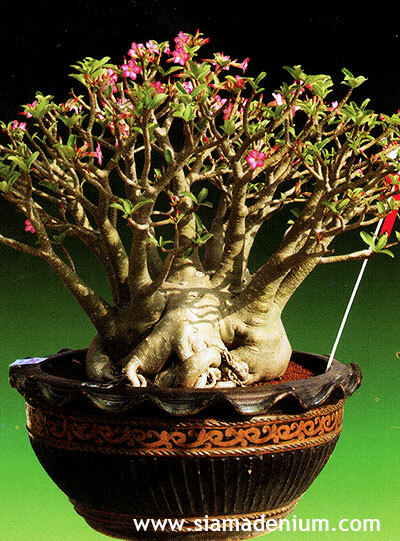 In here, Thailand, there are 6 distinctive forms following with Adenium structure and contest styles. ecause of attractive forms, various blooms and species, Adeniums or Desert Roses have become well-known and popular among plant lovers and collectors. Recently, Thai breeders and growers can pollinate Adeniums’ flowers by hands, leading to a wide variety of hybrids. Ok, let’s begin now. 1. Arabicum Style: Here we have about 11 Arabicum varieties. This form is the most popular for collectors and players. 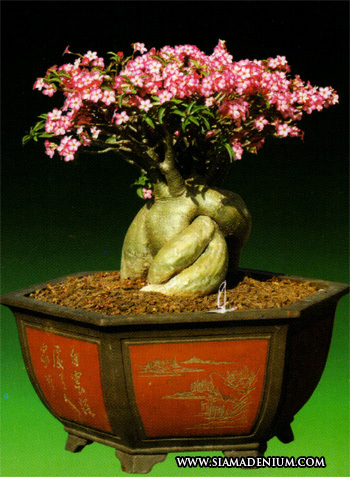 In Arabicum, we like round and chubby caudex, shorten neck and bushy branches on top. Due to naturally faster growing, it’s easy to grow it, just keep changing the pot and they will get bigger and bigger. 2. Obesum Caudex & Root Show: This form is very attractive especially with twisted roots. 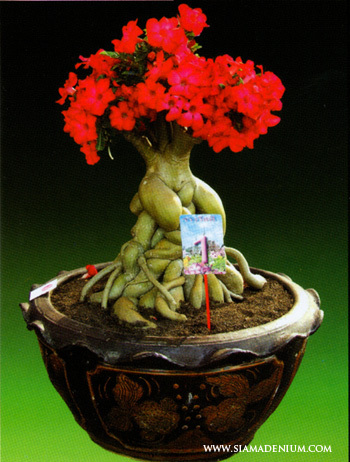 Collectors and players like to use this as rootstock and make grafting on them with colorful Adenium flowers. This form mostly comes from Obesum hybrid. The productive and big flowers, for grafting use, would be perfect matched with this form. 3. 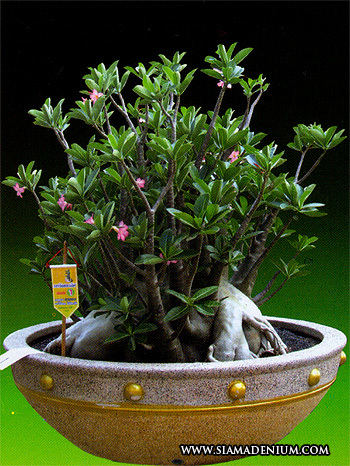 Obesum Rootstock with Bonsai Style: This is one of Adenium Bonsai styles and also called “Thai Rootstock”. 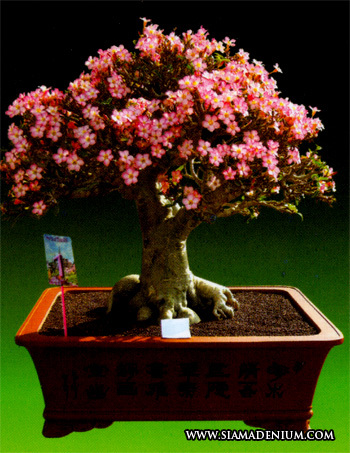 Most of this form comes from native Thai Obesum. 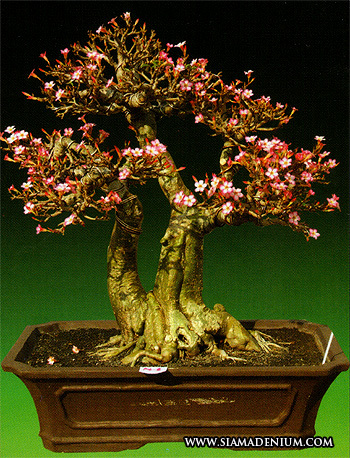 This rootstock’s form is pretty unique with high trunk from bottom and divided branch with bonsai pattern. The productive, small flowers and small or narrow leaves would be matched with this form. 4. 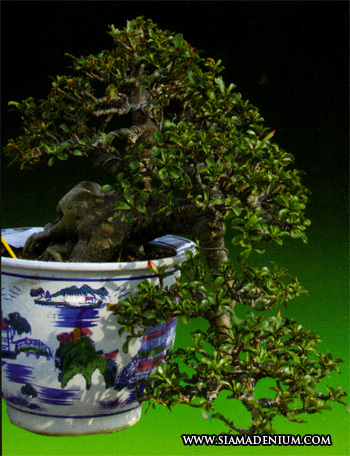 Air Layering with Bonsai Style: This form is very popular in here, Indonesia and Malaysia. 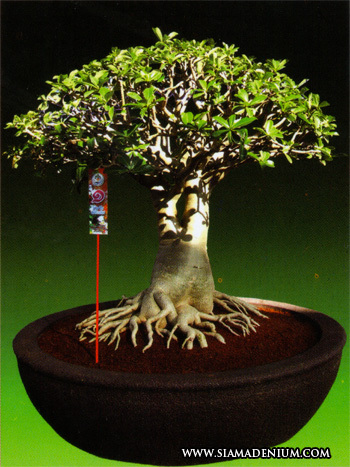 The best Adenium for Air Layering or cutting now is Arabicum: Ra Chi Nee Pan Dok (RCN). 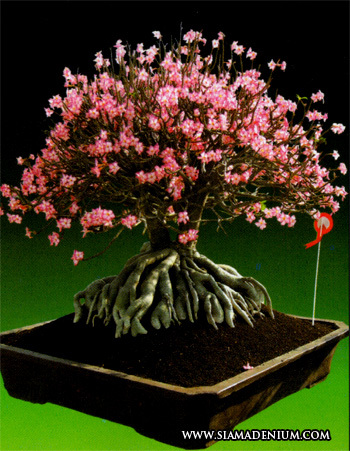 The popular style is centipede roots and bushy branches on top. RCN is the most productive flower in Arabicums so it will be very beautiful when full blooming. 5. 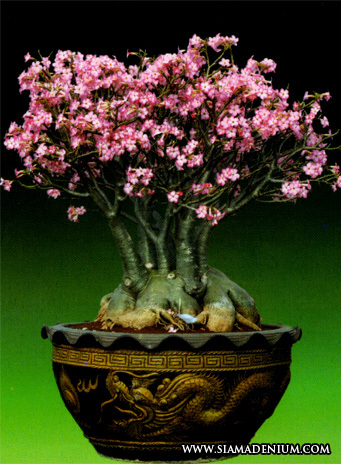 Seedling with Bonsai Style: This form is unique with nice spread roots, symmetric branches and antique caudex skin. The popular hybrids with this form are Arabicum and Thai Socotranum. We like to maintain seedlings bonsai style with age over 5 years. Now Thai Socotranum is very popular because this hybrid can provide the best root base (octopus style), symmetric branches with middle main stem, rapidly branch antinodes and antique caudex skin. 6. 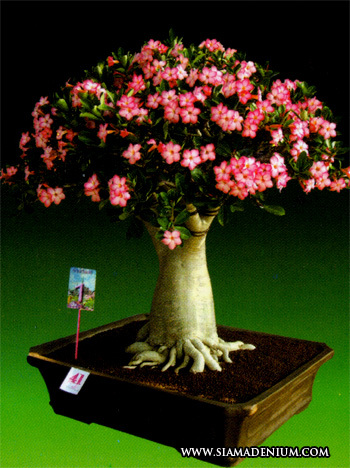 Somalense with tower style: Somalense is one of Adenium hybrids comes up with tall or tower style. 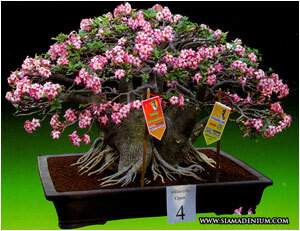 The popular style with this form is long trunk, bushy branches and blooming flowers on top. Mostly we like to make grafting on this and the perfect flowers would be small or medium size but they have to give very productive flowers. We have these forms available and also give you advice about matching flowers to graft on them. 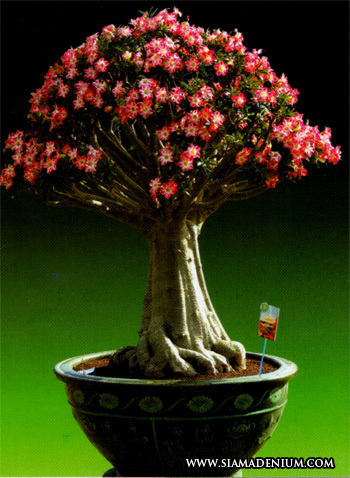 Enjoy growing adenium and have a nice day.